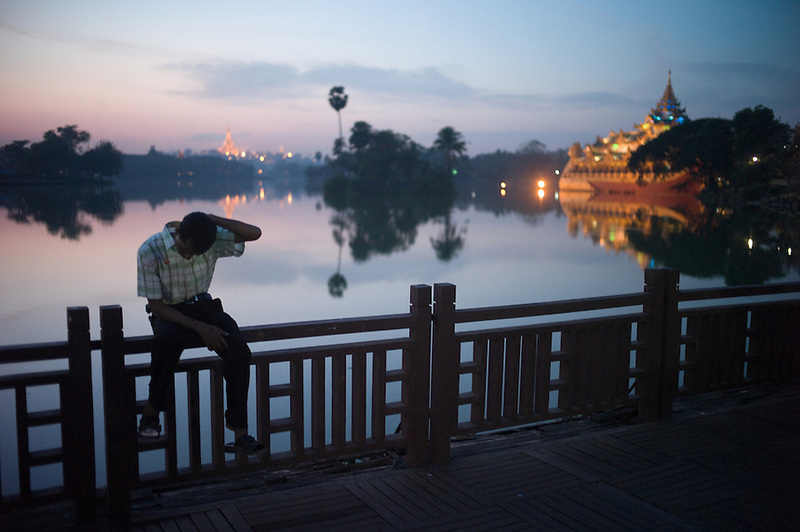 As the evening sun falls on Kandawgyi Lake near downtown Yangon (Rangoon), a passer by rests on a fence rail. At center the historic Shwedagon Paya glows The historic glows in the background, along with the government-financed Karaweik dinner theater which replicates a royal barge floating on the lake. Yangon, Union of Myanmar (Burma), Nov. 26, 2009...EDS: Not for syndication nor redistribution. Web slide show only. Please do not strip metadata for Web use.